Passionate and talented people are the power behind our business. The people behind our business, drive our growth. We’re always looking for talented and ambitious people to join our rapidly growing team. Yü Energy are one of the UK’s fastest growing business energy suppliers, serving thousands of companies across the country. We’re on a mission to shake-up the UK business energy market with our winning combination of expert, personal service and competitive prices. We’ve got ambitious plans for the future which means lots of exciting career progression opportunities. And you could be part of it! Brilliant and passionate people drive our success. So we provide a range of benefits to support and reward our team and to encourage the best to join us. We’ll review your salary annually and offer a company pension as well as an additional Wellbeing reward. You’ll receive 22 days holiday per year plus bank holidays. Buy up to 5 extra days if you want. Get 3 days extra leave if you get married and leave early on your birthday - yay! Start or leave early to help you manage those all-important medical appointments. Our Yü Made a Difference Awards recognise our team members who’ve gone above and beyond with a quarterly recognition day for us to celebrate. We’ll offer a helping hand with our travel loan scheme, eye test vouchers and employee assistance programme. Through a blended approach we’ll support you with your career and skills development. The work is challenging and requires you to grow. This, coupled with a strong supportive culture and great work colleagues, is why I’m very happy to have made the move to Yü! I am completing my year in industry here at Yü Energy. I have gained so much vital experience from working in such a fast-paced environment. My colleagues have played a massive part in my time here; each and every one of them are approachable and welcoming. 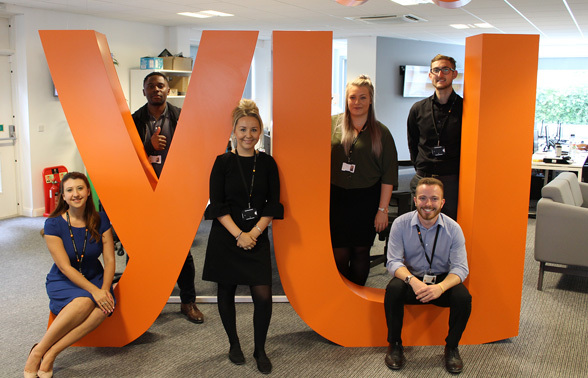 I continue to enjoy working at Yü Energy, a workplace with a fun and friendly atmosphere and a diverse workforce of very talented people. What's not to love? We’re always looking for talented and ambitious people to join us.